This book addresses those aspects of anaesthetic practice in perioperative medicine which have a significant impact on both the immediate and the long-term outcome for the surgical patient. Perioperative Medicine is the natural evolution of anaesthesia from a main focus on the patient in the operating room to a responsibility for the care of the patient from the time that the decision to operate is made, through to discharge from hospital. 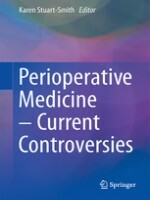 The contributors, well-respected authors in their field, discuss the role of the perioperative medicine specialist in areas ranging from pre-operative assessment and physiological optimization via pre-habilitation, to intra-operative anaesthetic management, and post-operative care. Controversial topics discussed include fluid therapy, anaesthesia and cancer outcomes, pharmacological management of cardiac risk, and the evolution of acute to chronic pain. Developments in regional anaesthesia, quality of recovery scoring, and lung ultrasound, are described. It is hoped that the chapters contained in this book will help to define the nascent specialty that is Perioperative Medicine, and encourage further debate, research, and expansion of this vital new frontier in anaesthetic care.